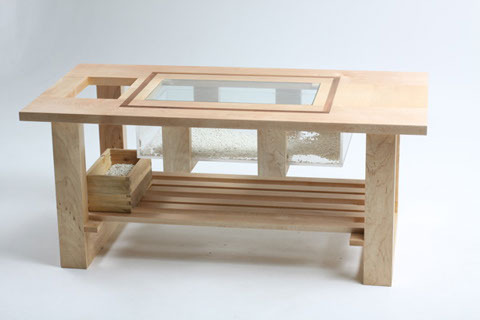 The concept behind the design of the custom built coffee table is to bring nature and serenity into an urban dwelling. Plants and aquatic life will be incorporated to bring liveliness to the urban environment. This piece is made out of maple wood with walnut wood inlay that wraps around the opening with the piece of polished glass. A removable fish tank is held by wooden brackets and slightly over sized to have a seamless look when view from above the table. The small opening on the side of the table can be used to place tall plants.